If an organization fails to anticipate, respond to, and initiate change as a matter of policy, will it survive? This question is on the minds of corporate executives, department heads, shareholders, industry leaders, and others. Change impacts our personal and business lives at an ever-increasing pace, yet we are often unprepared to take advantage of it. 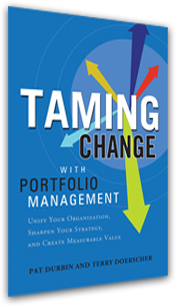 "Change is relentless, coming at an ever-increasing speed," asserts Pat Durbin, co-author of a new book that shows how corporations can systematically manage change, entitled Taming Change with Portfolio Management, he adds: "The most effective leaders approach change as a powerful force to be anticipated and leveraged. They tame change by managing it in a systematic way." With more than 50 years of combined industry experience, Pat Durbin and Terry Doerscher have collaborated on this 352 page book of management expertise and practical guidance, brought to life with more than 60 illustrations. Get your copy of this take-action guide to harnessing the power of change with the cutting-edge discipline of portfolio management.